​First, I will again read a piece I received, at the same time, from the Holy Spirit. It speaks, among other things, about the White Tara. Father, so almighty, You sit upon Your throne. Mother, so occupied with praying. when will they be reaped? Father, whose Will keeps the Universe in its right place. to God the Father’s words, and Your prayers. Son, Your seeds aren’t receiving enough care to grow. It does not seem that it will succeed. through layers of Worlds, known and unknown. for Michael stands within Her body. flowing through the floor and surface of the Earth. and Mother had ceased to pray? Did you believe Christ had sunk into the veil of oblivion? when the Daughter joins the Trinity. the promise We give is always kept. lays itself upon the Earth to sanctify it. as the Son redeemed the male evil*. The White Tara is the female aspect, or principle, of God, in female form. The White Tara is an energy. It is dazzlingly white, but can also come in all the colours of the seven rays. The White Tara descends into female Masters, and initiates and disciples, and creates effects on the planet. But, since the Mother aspect has not been valued and honoured for a long time, the White Tara has not had the opportunity to influence humanity with much effect. The White Tara, or the female God energy – It can be called Isis or Mary just as well – has been utilising different female Masters, and brought humanity to greater realisation. But it has not been much present for the last 2,000 years. Even if Christians are devoted to Virgin Mary, they still haven’t understood how to open their hearts to Her. They haven’t understood Her real significance. They have rather walked the male path, through Jesus, and have not managed to open their hearts to the Mother, able to redeem all unrest, all war. The White Tara has now come down to Earth through the new Tara – the new vehicle – as well as other vehicles which will be used more, or less. The new Tara is more powerful than the other Taras who have been on Earth because the White Tara works much on the first ray. And thus the Will of God merges with the Mother Principle to create peace and order on Earth, for we have passed into the Age of Aquarius, representing peace and order. And the White Tara creates peace and order, and creates peace where there is conflict; harmony where there is disharmony; balance where there is imbalance. The White Tara speaks to man on his/her level, whereas the male Masters, the male energies, speak more to man’s mental and higher bodies. It is so that the female energies speak more to man's emotions, and therefore we need them today, because the emotional bodies are totally out of control on Earth. It is the female Masters, especially through the Heart of the White Tara, who will create purified astral bodies on the planet and that, of course, will also influence the astral body of the planet. That is why we see many people becoming saints. We have seen saints on the Earth, but not that many; and those saints were pure, astrally pure, emotionally pure people. We will see many saints due to the appearance of the White Tara in man: those people who will work without desire, unselfishly for the Earth. It will compensate for the imbalance we have seen due to the masculine principle governing the Earth for so long. The White Tara stands for the effect of the white ray through women, and souls who have female personalities. And many women will thus be able to become Masters in the New Age, whereas it was very difficult for women to become Masters in the Old Age, as well as in the old ages. That is why there is a misunderstood Indian teaching saying that women cannot become Masters – souls, great souls, do not work through women. They haven’t respected and understood the role of the Mother on Earth; haven’t understood they live in the womb of the Mother; that they are all born through the Mother, for matter is the Mother. And as long as one does not respect matter, one does not respect one's own body, nor does one respect the Hierarchy, because the Hierarchy also lives in matter - It is the light within matter. And what you do not respect, you do not open to, and then you do not get the light. The Mother gives understanding of light, whereas the negative forces, they give understanding of darkness, and awaken desire in man to walk the way of darkness. The Mother awakens the desire to walk the way of light. That desire is positive, for such desires we must have or we are not getting anywhere on the Path of Light. Now, on Earth is being created what is called the 'Way of the Heart'. We have never had this on Earth before. The White Tara, the energy of the Mother, is the door to the Lord Maitreya's Heart. If you do not walk through the White Tara, you will not reach the Heart of Lord Maitreya, and this means that you cannot reach the Christ. We cannot reach this enormous Being of light called Maitreya, who is on a very different energy frequency to Jesus, if we don’t walk through the White Tara. Now I will write on the board, and then you shall look at it on the board here. See, a door has opened up which has not been open to humanity before and that door, that is the White Tara. And that door leads directly up to the ​Heart of Maitreya. Most aspirants can only walk through the door of the White Tara and reach here, or here, or here, or here. It is only disciples who can walk through the Heart, and then you walk in through another door. This door leads to the Solar Logos, because the Heart of Lord Maitreya is actually the door to an even higher Being, who is the Solar Logos Himself. Therefore, we have an enormous evolution on the planet which is that humanity shall come in through Tara, the Mother – understand the Mother, respect the Mother – in through. They now walk along the Path of Light towards Maitreya. And then, there is a wealth of disciples and greater souls who will come right into the Solar Logos, and this has not happened to other than very, very few. ​See, the Solar Logos, this enormous Being, has nothing to do with the physical sun of the Earth. 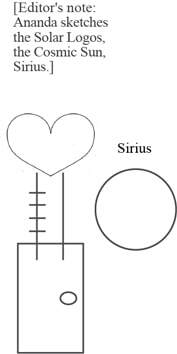 It is Sirius we are talking about here, the Cosmic Sun. Here lies a part of the Power of God, and this energy spreads out over the whole Universe. But the Solar Logos, this enormous Being, is the body of the whole Universe. All planets and stars in this Universe lie in the body of the Solar Logos, and the Solar Logos is God, Father-Mother, whose representative we have on the Earth in the Inner King of Earth. Maitreya, who is the Son, who is the Christ; the Mother, who is the Holy Spirit, the third ray aspect; and the Father, who is Michael. We have got a power on Earth we have never had before. This power is Michael, who now stands in the place of the Father. ​He stands in the place of Sanat Kumara, or in the place of the Inner King of Earth. Then we have Maitreya, who is the Son, and then we have the White Tara, who is the Mother. Look at it as first, second and third rays of the Solar Logos, before they are transformed down into lower powers. That is the Trinity. Those three powers come together in the New Age They have begun. It is those three powers which will bring about the Earth being born anew. It is those three powers which will be released on Earth in 500 years, when the White Tara again takes an incarnation through a physical vehicle who becomes Maitreya's mother. Maitreya goes directly down into matter, and is born and becomes as a child on the planet again – going through a stage called child, adult and so on. 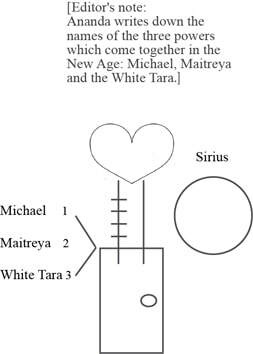 Michael incarnates in a male vehicle who marries the vehicle of the White Tara, and thereby They create the Son, Maitreya. This power, which is released now, will be fully released through this Trinity which becomes physical, and thereby, the Earth will be lifted to another level, and the Aquarian Age, one can say, in 500 years begins to function. We need to expand our consciousness over the next 500 years in order at all to manage what will happen in 500 years. These three powers work through certain vehicles, and these vehicles create a luminous effect on the planet which makes people’s consciousness rise, so that they are ready to receive the Teaching of Maitreya when the Teaching comes in 500 years. What is being created now is only the beginning of it all. The religion being created now, is a forerunner religion of the religion Maitreya Himself will create in 500 years, and this religion is called the Doctrine of the Heart, the Teaching of the Heart. And this religion, Blavatsky has already spoken about 100 years ago in The Secret Doctrine. Some of the Teaching of the Heart is coming through now, to create effects in the heart, so that people will be able to open their heart chakras when the Lord Maitreya is standing here in the physical. What is happening on Earth now is that the heart centre will manifest in people. It is so that, in most people, it is the higher chakras in the highly developed people that function. The heart centres don't necessarily function particularly brilliantly in people, nor in the disciples, because the disciples still have so many desires and so many problems in their personalities. When the heart centres open, desire and fear disappear, and the personality is redeemed. And this, many disciples and great souls are fighting against. Namely, they do not wish to redeem the personality, they do not wish to submit totally to the Will of God, and they do not wish to become light, for then they cannot live on Earth the same way any longer. And this also frightens them, and the personality is afraid. The fear of the personality, and the fear of the elementals within the personality, create fearful effects which cause people to be very afraid of the energy that now descends over the Earth, for they do not understand that, even if the personality dies, then an even higher personality will be created. The soul is a very great personality, and this soul, indeed, is one’s true self. This power [the Trinity] gives contact to the soul, and where those people who have wished for soul contact have not succeeded in gaining soul contact, they will now succeed. They will succeed for the next 500 years. 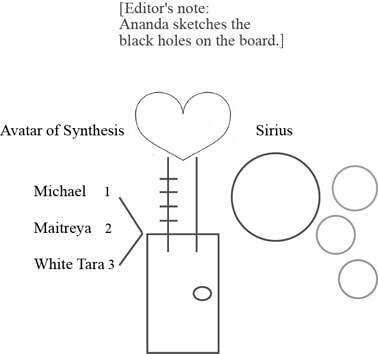 There are approximately four incarnations for people, and these incarnations are used to the full to create effects in the higher bodies and in the heart centre, connecting the heart centre with the third eye, so they can understand Maitreya when He comes to Earth, and acquire His Teaching. Maitreya will speak to a much larger audience than Jesus ever made contact with, due to media. Because of what one can call 'the media' we have at our disposal in 500 years, the Lord Maitreya will be able to speak to all of humanity at the same time. You know, Jesus didn’t manage that. It is well known that Jesus enlightened 500 people - or Christ through Jesus - and that Jesus did talk to crowds. But the impact Maitreya will have has never happened on the planet before, due to the media. Maitreya will stand in every living room and speak, in 500 years, and therefore, all of the human population here on Earth must be redeemed. That is not attainable, which is why we will have cataclysmic actions that Michael speaks about. Certain effects will come, geological effects on Earth, which will remove a part of the population during the next 500 years, but possibly not as many as has been prophesied due to the work happening from now on to redeem humanity by other means. ​The Avatar of Synthesis, as I talked a little about yesterday, utilises this threefold power to create geological effects on the planet, which will remove a certain percentage of humanity destined to transfer to other planets for their development. For when Maitreya, He stands here on this planet in 500 years, humanity must be prepared and able to receive that light and that love. That is why all the souls who are not developed enough to create light in their personality, are going to be removed from the planet. We only dream and hope that it won't be at once that this is created, as it will have a very, very shocking effect on the Earth itself and its population, and these shock effects will go into many, many lives in the future. So, we hope that we can – by working very, very powerfully with this power, by letting it work in our lives – avoid getting certain effects on Earth. The White Tara is, therefore, called the Mother of Mercy. It is very interesting, when I transmit messages from the Hierarchy, that these Beings say more or less the same, and this I shall explain to you. It is because They say it on Their level of development, on Their frequency. They are the Earth’s hope, mercy and grace, healing and blessing. 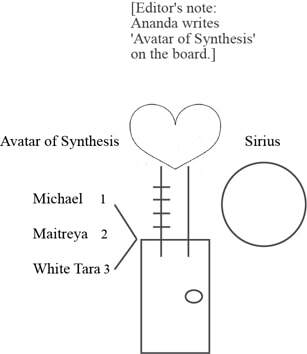 When the White Tara says it, you get it on one frequency; when Jesus says it, you get it on another frequency; when the Avatar of Synthesis says it, you get it on that frequency. And that is why it is said in this way, because it is with energy They wish to touch your inner bodies. The words give energy. The words are mantric sentences which, if they are repeated, create effects in your inner bodies. When these great Beings then come here, They say the same thing, so to speak, as you are getting the effect on many levels, because it is God who speaks and God is everything. God is mercy, grace, forgiveness, love, redemption, light – God is everything. And it is God who speaks through these Beings, as His instruments, His Godly instruments I would rather say. And God speaks to man today as God has done only to few people on the planet in earlier lives. God has spoken through Moses. It was Michael He used. God has spoken through the great Masters. God has spoken through certain disciples. And it is very often Michael, God speaks through, for Michael is the countenance of God. There are many who don’t at all understand what Michael is. Michael is not only the greatest archangel of the Seven, He is God’s direct representative for the Will of God. He is God’s countenance and Michael is the prophet of prophets. It is that voice which always speaks through all prophets, whether they are women or men. You cannot avoid Michael. Michael incarnates in matter through vehicles, from time to time, on the planet to create enormous changes. And, as soon as He appears, then new religions and philosophies come here which are thoroughly necessary in the development of mankind. There is nobody who really understands Michael’s role here on Earth. Michael is the greatest archangel. He is the Son of God, the greatest. It is from this soul that Jesus has come forth, for Jesus and Michael are the same soul, the same Being – Jesus is just human, Michael an archangel. It is Michael who fights the negative principle on Earth. He is the 'Dragon Slayer’, the one who kills the dragon or gains control over the dragon – which is also the human personality. It is the negative powers through the personality. Michael has never been so powerfully here on the Earth as now, and with Him comes lightning and thunder on the inner planes, which sometimes reach down to the physical plane. And that gives light in man, He says. It gives great, great light effects on the planet, never seen before. Michael is the seed of the Father, the principle of the Father. When the Father and the Mother come together, the Son is created – the Light – and therefore the Great Son is created, in 500 years. The 'Great Son' because the Lord Maitreya contains both the Christ and the Buddha. See, where the Lord Gautama, He became the Buddha, and Jesus gave Maitreya the Christ initiation on the cross, there Maitreya is both powers in one person. This is why the new world religion is a merging of Buddhism and Christianity. This has never been seen on the planet before. The two greatest Beings come together in Maitreya. Gautama, who will fully become the Earth’s Inner King in 500 years, is making use of Maitreya and therefore, Maitreya may become the greatest avatar and World Teacher this Earth has ever seen for, through Maitreya in 500 years, then effects will be created which have never been seen on the planet before. People will collectively be given clairvoyant abilities again, on a much higher level than on Atlantis, and they will be so open in their heart centres that they will not misuse these powers. For that would be what one would do even today since, when the heart is not open, we cannot use the higher clairvoyant abilities, we cannot understand them. And all fear of spiritual development will disappear, and all misunderstandings regarding the spiritual laws will be gone, and it is only then humankind will enter into what you could call a thousand year kingdom of peace. It begins little by little. We have received certain information, very interesting information, that certain effects are happening on the planet now which will bind what you could call the luciferic power, the negative power, for a thousand years. There are, out in the Universe, what one calls black holes, large black holes. And they are also found on the Earth and, where black holes are found, there can never be peace. And these black holes, Michael repairs. It is one of His missions; it is one of His acts. He has now been given permission to repair the black holes created by the negative powers which have been practising black magic in the same places for centuries, if not millennia. It is simply black holes under the Earth creating terrible effects in the people living there. Michael has begun to close the black holes, and the power one calls the 'principle of darkness' will be bound by Michael in one of the largest black holes of the Universe. Then human beings will develop much more easily than they do now, as they will not be stimulated by the darkness. But, in a thousand years, this large negative being, and this principle, will be allowed to come forth again, to test human beings again to see what they have learnt. But, if this being does not work in a balanced and correct way, it will be bound for eternity. That is the prophecy. Therefore, we will have a kind of peace for a thousand years, but it will not last for more than a thousand years when certain effects will come again. And, if these effects then teach humanity what they have to learn, and this being what it has to learn, then peace will come to the planet. Michael is constantly working to create peace, but is unable to create peace as long as human personalities don’t want it. The White Tara, who has now come to Earth, She will help human beings to understand peace. The love the White Tara radiates will make human beings understand to live by the cosmic laws. So, we are walking towards a fantastically important time – towards a brilliant time. On Earth there have been, and still are, other Taras. See, God, the Mother God principle, also lives through the Green Tara, the Golden Tara, the Blue Tara. This means that female vehicles who work for the Tara principle, the Mother principle, can be given certain missions which go under the seven different rays. For instance, in America there is a spiritual teacher who works a lot as the Green and Violet Tara. It is very, very necessary you understand that this Tara principle can utilise many different vehicles on different levels; also other frequencies of energy and other abilities which are needed. It was very interesting – I read in a book I was given two years ago about Elizabeth I, who was the symbol of the Green Tara and seen as the Virgin Queen by her people. She became the symbol of the Mother – both the young and the old, and simply, the Mother principle – and that was one of the reasons she did not marry. She had to live up to the symbol. Now, we know of course that Elizabeth I was afraid to marry. She was afraid to have a husband who would then become king, because she could remember what had happened before she became queen – how, when the king gained power, he could behead his wives and do other things without any trouble. Therefore she was very, very afraid of having a husband by her side who would take over the throne. But she was used in that incarnation, as her country’s great female ideal, and was portrayed in paintings with lilies on her clothes and different symbols, showing she was the Mother of the land. She also, of course, became a very, very great power for that country, as she was queen for so long. And England has never forgotten Elizabeth I, who had the same soul as was behind Victoria. It is a very exciting thing with the White Tara's energy, to see how it works. Yes, one can certainly talk a lot about the White Tara. Buddhism, the Tibetan Buddhists, of course have literature about the White Tara, but I have looked in that literature. She is the 'Mother of Buddha' or the 'Mother of the Buddhas' with the Tibetans. That is also correct. She is also the 'Mother of the Christs'. But I can see, from the collected written material, that it is an energy which is nowhere near the higher level energy the White Tara sends today. I would like to read something to you, even if it is in English, that the White Tara has said through me, and it gives Her energy totally as how She appears today. It is really very occult, so you really need to read it but you will gradually get it in writing. White Tara – it is actually easy English, so you just have to listen to it, and then you will see what the White Tara truly is today. I am the White Tara, the Way of the Heart, the penetrating influence through which you may enter, through the eye of the needle, into heavenly worlds of bliss, where there is no fear, no time, but only the brilliant light of the thousand suns that has penetrated the barrier of decay, to enter into heavenly worlds – I, Myself, a sun behind a thousand suns. With each breath I take, I give life to the thousand suns. With every out-breathing that I make, I hold the sphere in motion. I am Tara the White, the sun behind the suns; the penetrator of minds and hearts; the developer of worlds known to worlds unknown. The White Tara is the sun behind all other suns, so you can understand the power. The White Tara keeps the whole Universe still, and creates worlds. On the lotus I am seated, in the form of a young girl whose purity and innocence make up for all the evil in the world. She is the symbol of purity, and it is this purity that will overshadow the evil of the Earth. In the night, I bring the lotus to My crown, and I turn it upside down and it enfolds Me throughout the night when other forces are unleashed – when Michael the Protector takes over the protection of worlds known and worlds unknown. In the night, the energy of the White Tara hides. Michael takes over as the protector of the light. At the first dawn of light, My lotus opens up; it turns, it descends and again I am seated upon it, the Queen of Light and Day. Meditation upon Myself brings new glow, new health to bodies of flesh, to bodies of light, for I am empowered by the Son, the Buddhas of Earth, to bring new life even into the physical level of decay. I bring an end to all stagnation, for I am the time changer. I make the oceans swell, the waves heave and the waves fall. I am the Being behind the Moon that tries to still the negative effects of the Moon corpse upon Earth. See, White Tara is known for bringing life where there is decay and for bringing long - what one calls long life, to such bodies as we have down here on the physical plane. She brings (how do you say it in Danish?) – stagnation ceases, and She is the energy that lies behind the Moon, and tries to diminish the bad effects moon life has upon the Earth. When I have been worshipped in the temples of Atlantis and Egypt as the Moon Goddess, it was not the Moon itself but I, the Being behind the Moon, which was invoked, and My radiance was felt. It gave health and long life and brilliance of aura to My priestesses. See, when human beings have worshipped the Moon, She says, here on Earth, it is in reality not the Moon they have worshipped, but it is the Being who was behind the Moon, namely the White Tara. I want to give you of My health, of My long life, of My brilliance, of My purity and clarity, for you are to carry out for Me, My earthly duties. At New Moon I am easily approached – and we are approaching new moon, and that is when She is easiest to make contact with. At Full Moon I am covered by the evil of the world – you cannot reach Her, because, by the time of Full Moon, (that is occult), the evil in the world rises to its highest point. There, it is easier to contact the Hierarchy, the male Masters; – by the despair and by the agonised voices of mankind – the human being who cries in agony also covers the White Tara at Full Moon. I am now easily approached, for the New Moon has just been. I give thee My radiance if thou wilt but follow My advice. To work for the Hierarchy is difficult and strange; without the help of the Mother, impossible for there is pain in walking the Path of Righteousness. And some pain will be neutralised when walking the Way of the Heart, My way towards Maitreya, the Son. It is a dispensation given. One pain is substituted by another pain – that pain, the other one, more easily borne. She tries to help the disciples on the Earth to not have so much pain walking the spiritual Path, because the pain, the pain She talks about, it is more the inner pain, but there also comes outer pain. The White Tara, if you notice when you work with Her, will cause effects. You will get back pain and pain in the legs, pain in the bones, because the light of the White Tara is so penetrating that all the dirt lying in the body has to come out. Therefore, the White Tara is the one who will show you how you should eat better, and live more healthily to be able to manage Her energy. She is very physical. The male Masters, or the Masters in general, They are working a lot on the mental plane, but the White Tara reaches all the way down into the etheric body, and therefore there are many effects which She calls pain. But this pain, She says, is better than the pain which kills, because many disciples have been killed on the spiritual Path, as they have had too great a friction between the darkness of the personality and the sun, that is, the light of the soul. The White Tara redeems the darkness of the personality, so that more of the light of the soul can come through. Thus, there is less friction and, even if you get some pains, they are surely not the ones you will die from. They are not the ones creating the big illnesses which have caused disciples to pass over, like the big, big illnesses: cancer, large brain tumours, when the energy has become too severe – and so, and so, and so – disciple illnesses. Those you counteract by using the light of the White Tara. She says: I protect families against untimely death – She protects families against too early death – and premature departing, particularly this of departing too early because of the spiritual Path. I give, however, another death: that of the personality. It is a painful process but it is more easily coped with than the other pain of suffering emotional and physical torment. She says that the pain that comes from the personality dying is, after all, easier to bear than physical and emotional pain. The crucifixion will be a crucifixion of an inner nature, more than a physical crucifixion of an outer nature. See, crucifixions we cannot avoid as disciples but, instead of being crucified through the body, the physical hell we can live through, so the crucifixions are of an inner nature. And that is what people need to know when they walk into Shan the Rising Light. The inner crucifixion begins, more or less so one can manage, and it is this one that creates total redemption. I am allowed by Maitreya, the Son, to bring the developed souls to crucifixion of the inner nature, to spare them the crucifixion of the outer nature. She is allowed by Maitreya to bring developed souls to inner crucifixion instead of the outer. For instance, Martin Luther King, that was also crucifixion. He was shot. He was a light worker who worked well. That is what They mean by crucifixion. You die for the Cause, and sometimes the death can be unpleasantly long – that is, the death process. Then She says: That process takes another courage than needed before, for this process is longer. The crucifixion is lasting many years, whereas the outer crucifixion may last hours. To be killed or go through a crucifixion, that takes some hours, She says, but the inner crucifixion, that actually lasts years. But it is still easier to bear, when you understand what it is you are working towards; that you are going through an ascension in the physical flesh, and that you will have times of joy and very beautiful experiences in-between. It is, therefore, the end of many going through terrible death processes, pain, torture in order to reach crucifixion. One then has to understand the inner crucifixion maybe, and the understanding of it makes it easier to bear. However, We need Our disciples and initiates working on the physical level of Earth. Should they be crucified one by one, We would have no helpers on this Earth. To go and remove the disciples just as they are working best for the Cause, that's not right, says the White Tara, and therefore you have got this dispensation, that you help the disciples to an inner redemption like this. And, as many disciples are approaching the higher development of the higher initiations, We would necessarily see many crucifixions on Earth. And, because so many disciples now are approaching the higher initiations, we will necessarily see an enormous number of crucifixions in all kinds of ways. And that is what They wish to avoid, the Hierarchy, for They do need Their disciples to stay alive. But, there is a law which says that disciples shall go through crucifixion to reach the higher initiations, and then soon, undeniably, we will have no disciples left on the planet, because there are many who are beginning to reach higher initiations in soul. These will, however, happen more within the inner nature, and be long drawn and traumatic for people without the necessary knowledge and understanding of the divine. It is necessary to have an understanding and knowledge about the esoteric, about the divine, for otherwise the inner crucifixions will become traumatic in nature. That is to say, you will come to suffer far too much emotionally and mentally – much more than is necessary. I, the White Tara, have been allowed to interfere with the evolution of the Earth to a degree which is not understood by mankind. The White Tara has been allowed to interfere with the evolution of the Earth, and do work which no others have been allowed to do. I have been empowered by the Solar Logos and His representative, the Lord Sanat Kumara, and the Lord Gautama, to seek, to find, and to choose and mark My people, and to give them My protection, as well as the protection of Michael, for them to remain alive. She has received the power from Sanat Kumara, the representative of the Solar Logos – Sanat Kumara and Gautama – to guide and select Her disciples, give them what you call the sign, Her distinctive mark, that they are allowed to survive the Path of Discipleship and become old, so that they will be allowed to work for at least 30 to 50 years as disciples. She also gives them Michael's protection, so they can stay alive, for there is an occult law you must understand. That is, with the protection of Michael, you cannot die. For as long as Michael protects in a certain way, you cannot die in the physical, and that is why all of His representatives on Earth have fulfilled their missions – and they have had the time to do that – and then He has taken the power away from them. It is an occult law that they can be allowed to die in peace. He did that with King Arthur and Joan of Arc. The sword they were given contained the power of Michael and, as long as they had the sword, they could not die. King Arthur gave it away to be able to die, and Joan of Arc buried it, so she could be killed. There is no other way around it. As long as you have the sword of Shamballa, or the power of Shamballa – that is, having Michael over you – then nothing can happen to you. You can be wounded, you cannot die. And the protection the disciples are given today is that Michael protects, so they can be allowed to work the years it takes to finish – to finish their mission, so to speak. But then, they also have to go through the inner crucifixion and not wish for it to end. They must cooperate. And it is very difficult to cooperate if you don’t have regular therapy and healing, because then it becomes too difficult a process to go through. That, no human being can manage, not even the great initiates. Healing and therapy are the solution to manage the inner crucifixion, and that is why the Hierarchy has released so many of those therapies and healing methods They are using today. So where many disciples would have been in the act of transition already, these disciples will remain working on the physical level for the Hierarchy. She says, where many of the disciples who would already be going through the process of dying now, there they survive. They can work for the Hierarchy. She continues: My presence has not been so strongly felt since the early days of Atlantis, and the early days of Egypt, where the Mother was revered and worshipped as part of God, as part of life itself. Thus one respected and worshipped the White Tara in Egypt and on Atlantis, as the Mother – as life itself. Lady Mary, an embodiment of Myself, has been revered and worshipped by millions on Earth, and this will continue, for My embodiments are revered and worshipped as the Mother God on Earth. And it is very, very interesting, if you now understand the energy of the White Tara. It is very interesting that the White Tara is manifesting Herself this way, just at the last moment before humanity gives up. Just at the last moment before the disciples have had enough of working for the Hierarchy – it has been too hard – the White Tara comes in. She gets dispensation, the mercy of God, forgiveness and, if you then cooperate with Her, then you get better health, longer life, better opportunities. We have a pause now for 5 minutes. Les Miserables (The Wretched), is a new musical based on the book by Victor Hugo and, the reason I really like the music from this musical, is that so much of it expresses unselfish love. It is all about unselfish love. The book is one of those masterpieces which is only about unselfish love – where we die, and we sacrifice ourselves so that other human beings are able to live. The piece of music you are listening to now – or the two pieces – that is the lady [Fantine] who has had to live from prostitution to be able to raise her child, and provide money for the child. The child is being looked after by an innkeeper and his appalling wife who torment the life out of the child. On her deathbed, she asks the main character [Jean Valjean] to look after the child, and he does. He is an escaped convict, if you remember the book, and he takes her with him into a new existence. But he has, of course, this policeman chasing him all the time. He [the policeman] is completely obsessed with finding him, and this is just so typically a soul dual of the main character. They think the same way, and they know each other so well, but one is working negatively, the other positively. The music you are hearing now is thus, very strongly, mother’s love; very strongly mother love coming through. And that is why you just have to hear it, because it is the music of the White Tara. She [Fantine] sings about the man she loved who has left her and the child. And the next song you will hear is when she is on her deathbed, and asks Jean Valjean to take care of the child – two different kinds of love. The book [Les Miserables] is recommended if you wish to understand what ‘heart centre’ stands for. See, the heart centre – I would like to talk a bit more about the heart centre. 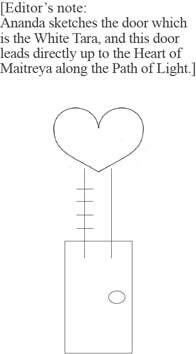 You see, the heart centre is not understood. It is written in yoga books that, when the heart opens, then you feel wonderful, all fear disappears.You live in a higher state of bliss. Everything is pure light. What isn’t written about in the yoga books, is how you feel before the heart centre is opened. This is when you have the opposite effects. You are afraid. A lot of fear comes out from all your fear programs, comes out and you are – feel yourself surrounded by darkness. You feel imbalance. You think you are terrible in all possible ways. And then people stop stimulating their heart centre because they do not understand that they just have to go through this process, and that healing and therapy help to get the process through faster. If you stop working with your heart centre, you cannot contact the Christ nor your own soul, for it is through the heart centre you contact the Christ, and your soul, and the light of the Hierarchy. Gautama, He talked about 'mind', as He worked through the third eye and the crown centre. Then, what suddenly happens is, because you in the West have stimulated the third eye more than the heart centre, you, by opening the heart centre, connect the two centres and you become balanced. But it is a slow process which goes so slowly for some that they don’t have the great effects, the unpleasant effects. But then it goes very fast for others, who have unpleasant effects. If you just understand that what you are going through is natural, and it is desirable, then you will manage much better. There is far too little information about the effects which the opening of the chakras really has in people, for you read books which tell how you feel when the chakras are open and active, and it is only the few who have that. You are, after all, in the process of opening chakras. The White Tara also works through the solar plexus centre, and that is why She is so easy to feel. She comes directly in through the emotional body. But then She goes directly through the emotional body, through the solar plexus and up into the heart, and begins to open the heart centre which unfolds. Therefore, you can temporarily go through imbalance, minor illnesses and strange effects. For what is it that gives illnesses – it is fear. It is not just bad karma, it is also fear, terrible fear. Where does your fear come from? It comes from your death processes. What human beings remember most of all is what happened just before death, and this is where you have fear from previous lives, for death has not been easy for everyone as it has to do with the different elements [earth, water, air, fire]. But the Hierarchy has promised that those who work well for the Cause, positively, will have good death, go through easy death processes. And therefore that, I think that alone, makes it worth working for the light. *​ 'Shan the Rising Light’ is a focus for the Rising Light of Maitreya Buddha, established in 1987. It is also the name used for the outer work at the end of the 1980s.